L is a good friend of mine. We have known each other since we were 11. This is how it happened; we sat together in class because at that time, the teachers arranged us according to our position in class and we so happen to have the same results. From there, our adventures are endless. We clicked and we bond until now, she still remained a very good friend, a confidante and a joy to be with. If banana leaf cuisine is your weakness, be sure not to miss out Passions of Kerala for the ultimate south Indian food experience. Opened in year 2000 by joint owners, Mr. Gary Nair and Mr. Achuthan Nair, the place is run by Mr. Murly Nair. It is actually a branch from Restaurant Innira’s (name had also been changed to Passions of Kerala) situated in Gelugor, Penang. 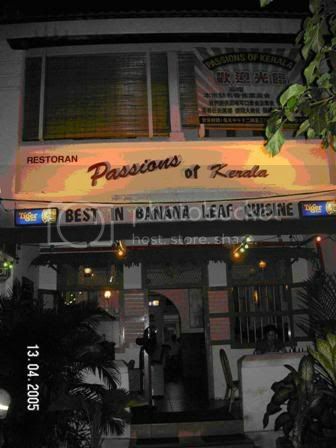 Passions of Kerala got its name from a type of seasonal flower called Passions that blooms right outside the restaurant and if you observe, the structure and interior of the place is made to look like a typical house in Kerala, situated in Southern India. Once seated and orders taken, a banana leaf will be spread in front of you. Service is fast where the staff will first serve 4 types of vegetables together with a generous amount of white rice on the banana leaf. There are 16 different types of vegetables served in the restaurant and the order changes on a daily basis. Customers are given 3 choices of curries to choose from, the exquisitely rich dhal, thick chicken curry and fish curry, the spiciest of the lot. The dhal is laden with different types of vegetables namely potatoes, legumes, tomatoes and its rich creamy sauce is definitely not to be missed. Unlike other restaurants all the dishes here are not precook. The restaurant’s policy is making sure every food is served hot and fresh from the stove. Customer’s satisfaction is highly regarded by Mr. Murly Nair for he knows that it is the only thing that will keep them coming back in the future. Diners have a variety of dishes to choose from, like the chicken and lamb masala, squids, crabs and fish and not forgetting the McNair’s fried chicken, their very own original fried chicken recipe. Every dishes found on the menu are cooked according to the Nairs grandmother’s recipe who originated from Kerala. Also, the restaurant makes and blends all of their spices. After your meal, there’s nothing better than to wash it down with a sweet lassi fruit drink, a blend of home-made yogurt and real fruit. The result is a deliciously thick and creamy drink enough to satisfy the gastronomical challenge pose by the rich herbs and spices found in the Keralite dishes. While dining, you will be soothed with light and entertaining music played in the restaurant. It is really the perfect place to enjoy a good meal and then unwind with your friends. Staffs are friendly and the food here will definitely keep you coming back for more. I also took the opportunity to ask Mr. Murly Nair about banana leaf etiquette. He said that in every gesture and things that we do lay a meaning behind it. The Indians have a way of folding their banana leaf after eating it according to occasions. During funerals, after the meal, it is a custom to fold the banana leaf upwards, away from our own body. This indicates that they do not wish to attend another funeral as it is an unhappy event. While on happier events like weddings, Indians will fold their banana leaf inwards, towards our own body which signify that they hope that they will have another happy event to graze again. TC, a British living in Penang frequents the restaurant for the ambience, quality food and the good money value of it. TC who had been eating curries since he was 17 actually had his first banana leaf cuisine in this restaurant, commented that it was love at first taste for him. So, the next time you crave for an Indian meal, be it lunch or dinner, Passions of Kerala will be the ultimate place to dine. when u wanna "chia gua jiak "
Hi rokh, thanks for your suggestions and comments. I'm glad you find my hummus recipe and serving ideas attractive! I love having celery sticks with peanut butter and some raisins. Have you tried it? it's called Ants on logs in the States. it makes a great party food. thanks for sharing popo's picture. Great post on Indian food and culture abroad.Being an Indian feels so nice when I read and see authentic Indian food and culture being promoted at its best.Thanks Rokh and L.
foodcrazee, when i come up cameron lu chia gua or gua chia lu? kel, no probs and your ideas sounds good too. i do have it with peanut butter. sailu, thanks, i'm sure L would be happy to know someone appreciates her write up.